Through the Wickets: Will Shorter Goalie Pads Lead to More Scoring? The NHL and NHLPA came to an agreement to use shorter goalie pads starting in the 2013-2014 season, but will it increase scoring as a whole for the league? As you can see in the photo, Marc-Andre Fleury of the Pittsburgh Penguins is a man who is used to having a lot of pad covering his 5-hole. In this picture he even employs a common technique used by many of today’s elite tendys: the pad overlap. This technique uses high thigh rises (above-the-knee pad lengths) to eliminate any 5-hole openings a shooter may see, regardless of how tightly the goaltender is squeezing his knees together in the butterfly. This is the primary reason the 5-hole has been a source of goalie pads experimentation over the past decade, and why it is still under the microscope today. However, there are a few other common denominators in the equation. 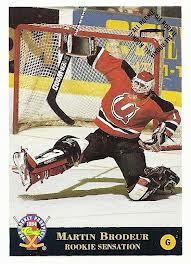 If you look back at the history of the NHL you will see a lot of equipment changes, mostly in the past 2 decades (just take a look at this Martin Brodeur rookie card below and compare it to today’s netminders). It has been over that time that goalie pads have expanded to ginormous proportions, and have been regulated back into reality for the good of the game. The original restrictions covered almost all of the tendy’s equipment in order to reduce the size of the goalie in the net, in turn increasing scoring (supposedly). We saw what happened when these were implemented in the early 2000s: goalies got more precise, quicker, and were able to negate most of the restriction’s primary purposes. Athletes that play the position also got a little smarter with their pad requirements. They realized that they could use the above-the-knee measurements to their advantage, covering their 5-hole constantly, and allowing for more dynamic saves in every situation. This brings us to our newest restrictions. The latest rule change set to eliminate the pad overlap problem by reducing the above-the-knee pad length from 55% to 45% of the knee to pelvis measurements. Will this 10% make a difference in the average game scores next season? I think we will be on the lookout for more restrictions on goalie pads in the future, as this latest one is open to interpretation. Since it is a relative decrease, and each individual goaltender has always been able to select their personal pad preference, I don’t think this change will have much affect on their play as a whole (i.e. across the league). I do think that some goaltenders (mainly those with very high thigh rises, +2 and higher such as Fleury) will find these new restrictions a bit much at first, but over time will adjust their game accordingly. This means shoot early and often against shorter goaltenders, and try and snipe corners on the big guys (nothing new there). Overall this 10% pad decrease will open up the wickets for quality deflections and quick snipes, but if history is any indication, it won’t last long. As shown in this video (courtesy of NHL.com), many of the league’s elite are already becoming comfortable in their new goalie pads, and aren’t looking back. It has been said that they do look and feel like a lot less pad, but only those with very wide butterflies such as Marc-Andre Fleury will be most affected. Overall, I think this is a step in the right direction for the game, but only time will tell. The NHL needs to make another round of cuts to the equipment, which I feel should be its last. The line between increasing scoring and goaltender safety is blurring quickly, and knowing that more restrictions are coming is unsettling for any goalie. Thigh guards have already been the culprit of a cut, and currently you must wear thigh guards that contour your knee and are worn solely on the knee itself. This can leave certain areas unprotected, which will need to be addressed in the near future. At the end of the day regardless of what limits to goalie pads are in place, one fact remains: NHL goalies are extremely good athletes. No matter how you slice the cake, history has shown that whatever the task may be, a goalie is up to the challenge. So will this last round of rules finally increase the scoring around the league, I don’t think so. Will it cause some interesting scenarios behind the bench, yes. Look for the trend of large goalies around the league to continue as they should be least affected by the new pad restrictions, and look for more focus on off ice flexibility to become prominent in every goalie’s game. If you like what you’ve just read follow me on Twitter: @pep30. The NHL regular season schedule was released on Friday. Check out our partners at TiqIQ for the best deals on NHL tickets for all 2013-14 games.